Monoject curved tip syringe has a 12mL capacity, is ungraduated, and non-sterile. Ideal for pressure irrigation. Good product, great price, fast service. 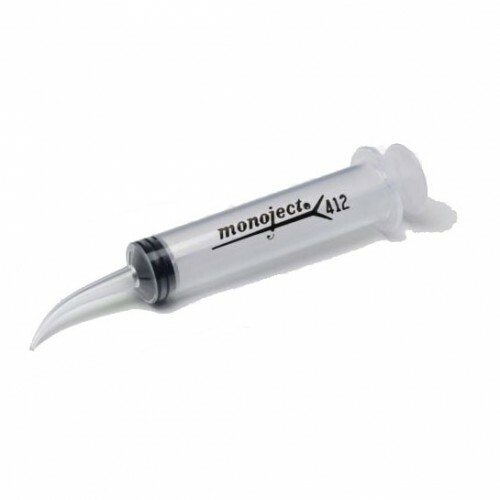 Ordered the Monoject 12cc curved tip syringe. Great for oral health maintenance after gum or oral health surgery issues. These work very well at cleaning/flushing debris out of gaps/pockets etc between your teeth. Ordered 25, received 25 in 3 days and work as I expected. Oh, and by the way, the product IS stamped "Made in the USA" on the small handle. That's reassuring! I would not hesitate to order from them again.